Here we go, finally. Baffert vs. Baffert. Undefeated vs. undefeated. Derby favorite vs. Derby favorite. Something’s gotta give. Baffert surprised a lot of people by his plans to run Game Winner and Improbable against each other March 9, but it’s all about logistics. Might as well stay home and duke it out instead of having to travel to Arkansas twice. Knowing Baffert, they’ll probably finish in a dead-heat and remain undefeated. You would think the edge here has to go to the more brilliant Improbable in what looks to be a small field with no speed, but Game Winner already has three grade 1s under his belt and with his running style would seem to get more out of a good second. In other words, most people would cut Game Winner more slack as long as he is finishing well and doesn’t get trounced. It is interesting that Baffert changed tactics in his final work, five furlongs in 1:00 3/5, having him break off inside and in front of Dr. Dorr, knowing he’s going to have to show more speed to keep up with Improbable. This may have been Game Winner’s best work, as he dug in, wouldn’t let Dr. Dorr pass him, while striding out beautifully in the stretch and galloping out strongly. The ideal scenario for Baffert other than a dead-heat would be for the more brilliant Improbable to beat Game Winner by a close margin with a big gap to third. But I’m sure he wouldn’t complain if it was the other way around. Being the more brilliant of the two and having more tactical speed gives him an advantage in the San Felipe, especially having raced more recently, although Game Winner is the more seasoned of the two. But at this point there doesn’t seem to be anyone to run with Improbable if he wants the lead. His five-furlong work in :59 4/5 was another thing of beauty, most notably that incredible stride. I am so impressed with how many flawless works he has turned in this year, working by himself. He is a textbook on how a horse should look in workouts. You can tell the difference between the two horses by the way he works in :59 4/5 by himself and taken wide, while Game Winner works in 1:00 3/5 in company with a top-class older horse and remaining much closer to the rail. Although one of the Baffert pair likely is going to taste defeat for the first time, it’s all about taking a solid first step and moving forward off it. There is more of a mystique surrounding Improbable because of the dominance of his victories and his flawless works, so there is a bigger bubble to burst if he should get beat. But, again, it is all about how the race is won, who has the tactical advantage, and who looks like they got more out of the race. I would think that after next week’s races there is a good chance Improbable will be the new No. 1, but we’ll see who actually looks more like a Derby horse. In any event, bring it on. I could have put several horses in this spot, but no one has yet to blow me away in any of the major preps so might has well let him hang around here until someone does … like next Saturday. He had an easy maintenance work, breezing a half in :50 1/5. There is still a question of the quality of competition at Fair Grounds this year, so we really have no idea what’s he been beating. You would think the Louisiana Derby will provide more of a test if they get some quality shippers. But that six-week gap to the Kentucky Derby still is bothersome, and there is a reason why Louisiana Derby winners and Fair Grounds-based 3-year-olds don’t win the Kentucky Derby. It’s a good series of preps, but the record in the Derby is what it is. That’s not to say he can’t end that trend. To his credit he has pretty much dominated his opponents on dirt and has done nothing wrong, doing everything like a pro. So let’s say at this point he is very solid. Yes, he is probably ranked too high for what he has accomplished and who he has been running against and the fact that he’s never been two turns, but sometimes you just have to go by gut feeling, and his Pasco romp was sheer brilliance. The Tampa Bay Derby is a huge jump, but his bullet :47 breeze, fastest of 75 works at the distance, indicates he is ready. Not only will we learn how good he is, but what his running style is. He showed good early speed going 5 1/2 furlongs, but then broke slowly in his two seven-furlong races and closed strongly from far back. His Brisnet speed figures are climbing with every race and his Thoro-Graph figure in the Pasco makes him one of the fastest 3-year-olds in the country. I can’t wait to see what he does going two turns after a little bit of a layoff. Remember, both his grandsires won the Kentucky Derby and Preakness and finished second in the Belmont Stakes. He had been in the Top 12 briefly and is the kind of horse you like to have back. I realize his late closing burst in the Fountain of Youth Stakes was visually impressive, but due in good part to a pace meltdown and very slow closing fractions. But he did come home his final sixteenth in about :06, making up four to five lengths. And the feeling here is that if Irad Ortiz had taken the inside path he probably would have won, as it opened up for a clear run. But he elected to swing six-wide and came up just short with his powerful late rally. He normally doesn’t come from as far back as 11 lengths, but he’s never encountered a pace this fast. We’ll have to see how far he wants to go, but his Brisnet late pace figures have been very strong. He should be even more formidable in the Florida Derby with the longer stretch. Depending on what happens next week he could very well move up a couple of places. The only reason he is just below Bourbon War is because, unlike the runner-up, he had an absolutely perfect trip and a perfect pace setup, saving ground behind a brutal pace that collapsed in front of him. He was able to pick up the pieces through a sluggish :26 2/5 and :07 closing fractions. And it was Code of Honor who came home in :07. But on the positive side it was a big rebound effort from the Mucho Macho Man dud and there is no reason why he shouldn’t improve off it. Before last year’s Breeders’ Cup I wrote a column ranking the horses in the Juvenile most likely to win the Kentucky Derby and I ranked him No. 1, with Game Winner No. 2. I am still a sucker for the Champagne Stakes and have a tremendous amount of respect for a horse who runs big going a flat mile in grade 1 company. The usually conservative McGaughey threw him right into the Champagne off a six-furlong maiden win and he appeared to lose all chance when he stumbled twice coming out of the gate and dropped far back. He swung out nearing the top of the stretch and closed well to finish second to the pacesetting Complexity in a rapid 1:34 3/5, one of the fastest Champagnes ever. I loved his last work before the Fountain of Youth and his performance was huge in that it brought him back to that Champagne effort, perfect trip or no perfect trip. Now it’s time to take another step forward. Baffert could run him in the March 24 Sunland Derby or the March 16 Rebel Stakes where he could also run Dessman. I would like to see him get tested in a full field of top-class stakes horses after coming off an easy score in a small field in the slop. The Rebel would also give him two more starts rather than have to go into the Derby off a six-week layoff. Forget his defeat to Improbable; it looks as if Baffert has taught him how to rate behind horses, as he has done in his recent works. He worked a half in :47 3/5 last week in company with Honeyfromthesouth. He was being pushed along in the stretch but couldn’t get by his workmate, finishing a head back, and also didn’t get by her on the gallop-out. He came back with a five-furlong work in 1:00 1/5 on Tuesday. His Thoro-Graph number jumped 4 1/2 points from the Los Alamitos Futurity to the Robert Lewis, so he is improving and he does have the pedigree to keep stretching out in distance. He returned to the work tab with a :49 1/5 half-mile breeze in company with Yoshida, much to the satisfaction of Mott, who is happy with the way he came out of the Risen Star Stakes, which was an excellent learning experience. Each step he has taken so far has moved him forward and he looks like a horse who should be peaking on Derby Day. He is a big strong horse and I think he could probably use two more starts before the Kentucky Derby just to help him mature after his antics in the Risen Star, but it would seem the logical move is to bring him back to Fair Grounds for the Louisiana Derby, and I explained the possible pitfalls of doing that. We’ll see what Mott decides to do. Right now it was just good to see him back on the work tab and eyeballing the possible Dubai World Cup winner. Flavien Prat had his choice of several live Derby mounts but has landed on this colt, who is headed to Oaklawn for the March 16 Rebel Stakes. This will be his first start against open company so all he needs is to be right there at the finish, leaving something in the tank for the next two races. He is a powerhouse of a horse with a world of potential, and physically and visually just looks like a Derby horse. He worked five furlongs in 1:01 1/5 on Tuesday. Having had it so easy, what he needs more than anything is to look a good horse in the eye so we can see just what he’s made of. We know he can blow the doors off Cal-breds, now it’s time to get serious. He can use the Rebel as a steppingstone to his final prep, but he must be competitive and needs to be running strongly at the wire. If some hotshot narrowly beats him going 1 1/16 miles it’s not the end of the world. It’s when he gets to 1 1/8 miles that we’ll know what we need to about him. He breezed a half in :49 at Fair Grounds. He could stay home and wait for the Louisiana Derby, but more likely will head to Tampa for the March 9 Tampa Bay Derby. He would be far better off with two more starts, so this looks like a good spot for him and would set him up perfectly for a race like the Blue Grass Stakes or better still the Arkansas Derby if Casse wants the extra week on the front end rather than going into the Kentucky Derby. He is another with a world of potential based on his last start, which was one of the most impressive performances of the year. What makes it even more impressive is that the horse he trounced by 8 1/2 lengths, Courtyard, came back to win a mile and 70-yard allowance race Saturday, running down the 6-5 favorite Aquadini, who finished 13 3/4 lengths ahead of the third horse. He is back in the Top 12 after a very impressive five-furlong work in 1:00 4/5, suggesting his quarter crack is no longer an issue. He sat three lengths off a workmate, went inside him turning for home, and just glided down the stretch with great extension before galloping out with authority. He will get his big test in the March 16 Rebel Stakes. Although Nolo Contesto, who narrowly defeated him in a maiden race, ran below expectations last Friday, he has put that defeat behind him with his spectacular victory in the slop last time out. You never know with quarter cracks and you sure don’t want to see any setbacks at this stage, but he’s been patched up and apparently good as new judging by the way he was striding out in his workout and the fact that Mandella has no reservations about pushing on with him. I’m taking a shot with this guy because of his tremendous potential, as I wrote in detail last week. Even being green he still was able to crush a talented horse in Cave Run by nearly 12 lengths in fast time. To beat a stakes-placed horse who was bet down to 9-5 like that when you’re running with your head and ears up and apparently goofing off a little shows just how much more improvement he still has with a little more maturity. Just watching John Velazquez constantly looking back for competition gives you an idea how much confidence he had in him. And to show how much he’s improved, he went from double-digit Thoro-Graph numbers to a “4,” which puts him right there in contention with one more move forward. There were high hopes for him right from the beginning until they discovered the beginning of a condylar fracture after a third-place finish in the Saratoga Special. A screw was placed in the leg and he’s back better than ever. Even when he was being broken he did everything right. He had a wonderful way of going and did it all easily with that long stride of his. I believe this colt’s future is limitless and we haven’t seen anything even close to his peak. Boy are there going to be changes in the Top 12 after next weekend’s three big dirt stakes. Those changes have started already. The sad part of HIDDEN SCROLL’S fourth-place finish in the Fountain of Youth is not that he got beat, but that his chance to show he is a Derby horse was squandered when he wound up chasing a 132-1 shot who everyone knew was going to quit after a half-mile. After getting bumped and stumbling a bit coming out of the gate it was a perfect opportunity to take a little hold of him, let him settle in second and sit behind the longshot pacesetter. But instead he was allowed to go after him through testing fractions of :22 4/5 and :45 3/5. Of course, he eventually shook free from him, but the damage had been done and he never got more than a 1 1/2-length lead. So, unfortunately, we know little more about him after this race. 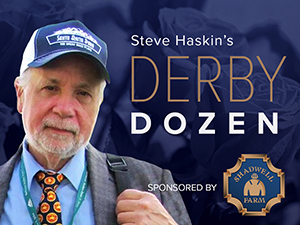 Having only three career starts before the Derby, each race needed to be a steppingstone and a learning experience as to how to be ready for the Derby with so little experience. Justify did it last year, but did it the right way. I thought he actually ran a good race to be beaten three lengths, but remember, they were crawling at the end with closing fractions of :26 2/5 and :07 flat. In short, I just thought this was a wasted opportunity when he had the perfect scenario with a built-in “rabbit.” But rabbits are for chasing, not fighting. Once you do that, and at 6-5 no less, you are just setting it up for the closers and all but eliminating your own chances. Hopefully, things will work out better in the Florida Derby if that is the path they choose. I still believe this is a very talented horse, but he now has to earn his way back into the Top 12. It was touch and go whether to put VEKOMA in the Top 12, but I’m not sure three horses from the Fountain of Youth deserve to be there, at least not right now. At one point I thought Vekoma was going to win it, as he put in a good move on the outside. But Code of Honor was moving a little stronger of the two on the inside, and it didn’t help Vekoma when the winner came out after turning for home right in Vekoma’s path, causing him to hesitate just enough. With his paddling action and not changing leads until late, he looked a bit out of sync and wasn’t able to sustain his move, running evenly through the final furlong, beaten 2 3/4 lengths. It was a good effort, especially off the layoff, and he should improve off it, but I’m just not sure how far he wants to go. As for some of the others, GLOBAL CAMPAIGN ran OK and made a brief run at Hidden Scroll, but also couldn’t sustain it. The fact that he was fifth, beaten 5 1/2 lengths and only a length in front of 94-1 shot UNION’S DESTINY make you wonder about the overall quality of the race. One way of determining good races and good horses is the separation at the finish, and with the first seven finishers, including a big bomb, finishing seven lengths apart, you just don’t know how strong a race it was. Right now it looks to be a good race with a decent 95 Beyer to the winner, but we need to see more and that should come in the Florida Derby. The big disappointment was SIGNALMAN, who was another half-length back in seventh. The pace set up for him and he was down on the inside where he likes to be, but he never fired. As I said last week, I wasn’t crazy about this spot for him. He just doesn’t have the speed or the quickness to excel at Gulfstream, especially at 1 1/16 miles with the short stretch. I think you’ll see a different horse in the Florida Derby, but he may be more suited to the Wood Memorial or Blue Grass Stakes. Wherever he runs next, I wouldn’t give up on him. We regretfully have to say goodbye to one of our favorites, SUPER STEED, who was knocked off the Derby trail with bone bruising, and to NOLO CONTESTO, both from the Top 12, after an uninspiring second at 4-5 to a very good horse in ROADSTER, but one who had not run in six months. I’m not so sure we saw the best of Nolo Contesto. Breaking from the rail in a five-horse field is OK if you use that as an advantage to take the lead and control the pace, even if that is not the best strategy to prepare for the Kentucky Derby. Joel Rosario looked to have an easy path to the lead going into the first turn, but he elected to take back while a 70-1 shot was allowed to crawl up front in 1:13 for the six furlongs. Ironically, if he had ridden Hidden Scroll like he rode Nolo Contesto and Nolo Contesto like he rode Hidden Scroll he might very well have won both races. Mike Smith, aboard Roadtser, had to have been salivating to be in a position to keep Nolo Contesto trapped down on the rail and prevent him from getting out, which is just what he did. Nolo Contesto never looked comfortable down there, and when it was time to dispose of the leader, Smith and Roadster got first run and never looked back, as Nolo Contesto basically came up empty, just edging out 19-1 shot Manhattan up for the place. With that 1:13 three quarters and clear sailing all the way, Roadtser was able to come home his final quarter in :24 1/5 and final eighth in :12 flat without ever feeling the whip. Even if Nolo Contesto had won by 20 lengths he still would have to finish first or second in the Santa Anita Derby to assure a spot in the Kentucky Derby. But by getting beat without threatening the winner it has to raise the question of whether he’s ready or even good enough to be competitive on the first Saturday in May. I still believe the talent is there, but it was only his third career start and first against winners and this did nothing to move him forward. As for Roadster, not bad for Bob Baffert’s fifth stringer. He ran back to his sensational six-furlong work in 1:10 3/5 two works back and he does have a pedigree to suggest he can continue to stretch out in distance. Remember, this was Baffert’s big buzz horse last summer after his impressive maiden victory. Now he is back in full throttle following surgery to correct a breathing problem. Baffert has just about every Derby prep locked up with contenders, so he will now have to find a spot for this promising son of Quality Road. We’re now into March and it’s no longer just about talent. Timing plays a big part in a horse’s status on the Derby trail. Case in point, I still believe MUCHO is an extremely talented colt, which is why I ranked him so high on the first Derby Dozen. On one hand it was great to finally see him return to the races and beat two pretty fast horses in a six-furlong allowance race. But I am trying to figure out a way he can make the Derby with a legitimate shot and I don’t see Mott pushing him. He still has a way to go to be competitive in top-class two-turn races. All I can come up with is to jump from six furlongs to 1 1/8 miles in a grade 1 or grade 2 and that is not Mott’s m.o. After the race, Mott said, “I think we need to sit down with the powers that be and just figure out if we want to stretch out next time or what we want to do, distance-wise. I think that’s the main thing we’ve got to talk about. I’m sure we will (stretch him out) at some point, whether it’s next time or not. We’ve got to start somewhere.” That “some point” looks more likely down the road a bit. I have loved this colt since his maiden race. Wherever he winds up he will be a serious two-turn horse, but that looks to be later on. With all eyes on Pletcher’s 4-5 shot SOLDADO in a one-mile allowance optional claimer at Gulfstream, it was Jason Servis who ran off with the race with the 2-1 FINAL JEOPARDY, who tracked the pace before drawing off to an impressive 3 3/4-length victory in a snappy ! :35 4/5. Still a bit green, drifting out from a left-handed whip, this was only his third start, having broken his maiden in impressive fashion at Gulfstream and then finishing third in the six-furlong Limehouse Stakes. By Street Sense, out of an Unbridled’s Song mare, his second dam, Fleet and Fancy, is by Belmont Stakes winner Touch Gold and is a half sister to 2-year-old champion Midshipman and grade 2 winner Fast Cookie, dam of Frosted. So he has some powerful bloodlines. Soldado, who was so impressive breaking his maiden last out, didn’t have the best of trips, getting bumped early and then having to race wide, but hung in there to finish third. Watch out for him next time. In the grass horses switching to dirt department, Pletcher has Bourbon Stakes winner CURRENT ready for the Tampa Bay Derby following a solid third-place finish in the Dania Beach Stakes. The son of Curlin is bred for the dirt, so we’ll see how he makes the transition. On Saturday, the Kiaran McLaughlin-trained A THREAD OF BLUE scored his third straight victory on grass and second straight stakes victory, winning the Palm Beach Stakes defeating Kitten’s Joy Stakes winner CASA CREED. The son of Hard Spun is also bred for the dirt and has already won an off-the-turf maiden race at Belmont by two lengths going wire-to-wire in 1:23 1/5 for the seven furlongs. As mentioned earlier, the Tom Amoss-trained COURTYARD, who had been crushed by Dream Maker last time out, turned in an impressive rally to run down 6-5 favorite AQUADINI in a mile and 70-yard allowance race at Fair Grounds. The son of Mizzen Mast was a $50,000 claim two races back in which he blew by horses in the stretch under Florent Geroux to win going away by 3 1/2 lengths. He is improving with every race and appears ready for bigger and better things. At Oaklawn Park, CAPTAIN VON TRAPP, yet another Steve Asmussen-trained 3-year-old, defeated a good horse in HIDDEN RULER to win a one-mile allowance race for his second straight victory. The son of Trappe Shot scored by one length, covering the mile in 1:38 1/5. In a 1 1/16-mile maiden race at Gulfstream, the 2,3,5 finishers against Hidden Scroll last time out came back to finish in 1,2,3 in reverse order, with fifth-place finisher IDENTIFIER scoring a wire-to-wire victory over third-place finisher RANGER UP and second-place finisher HIGH AMPLITUDE in 1:44 4/5. The Oaklawn Park-based horses pointing for the Rebel Stakes had better start preparing for an all-out California invasion, and these aren’t second tier horses by any means. As of now it is possible that Galilean, Omaha Beach, and Mucho Gusto or Dessman are all headed there. Omaha Beach and Dessman were supposed to run in that one-mile allowance race on Friday won by Roadster, but Omaha Beach suffered the quarter crack and Dessman scratched out of the race to possibly run in the Rebel instead. Wherever DESSMAN runs it likely will be without blinkers and he should improve big-time off his second-place finish in the seven-furlong San Vicente Stakes. Although No. 4 or even No. 5 in Bob Baffert’s pecking order, he is immensely talented and could be a live one. I am going to throw a name at you for the Rebel you might not be familiar with, but who could be a real sleeper. That is LAUGHING FOX, who has quietly put together back-to-back wins at Oaklawn, both of them in impressive fashion. This son of Union Rags is a relentless closer and his most recent victory in allowance company was only three-hundredths of a second slower than they ran the Southwest Stakes the same day. And his mile time of 1:37 3/5 in the 1 1/16-mile race was two-fifths faster than the exciting and highly touted maiden winner Intrepid Heart, also on the same day, and three-fifths faster than his talented stablemate Comedian, who also won on that same card.. He is a flashy-looking chestnut with four white socks and a blaze, and he bounced out of his victory by turning in a strong five-furlong work in 1:00 4/5. Keep an eye on this colt. For those wondering about the Todd Pletcher-trained SO ALIVE, Vino Rosso’s brother who hadn’t worked in a while, he finally showed up on the work tab and made a bit of a splash, breezing a half in a bullet :48 2/5, fastest of 24 works at the distance. Todd Pletcher also sent out Gotham possibility FEDERAL CASE for a bullet work, as he blazed his five panels in :59 2/5. Holy Bull winner HARVEY WALLBANGER, who skipped the Fountain of Youth, breezed five furlongs in 1:02 4/5 at Gulfstream Park. At Santa Anita, GUNMETAL GRAY worked six furlongs in 1:15 1/5 for the San Felipe, while San Vicente winner SPARKY VILLE went five furlongs in 1:04 1/5. EASY SHOT worked a half in :49 in company over an off track and I loved the way he cut the corner on the outside at the top of the stretch and going into the first turn on the gallop-out. He showed a lot of athleticism. Baffert sent out MUCH BETTER for a strong six-furlong work in 1:12 3/5 for the Gotham Stakes. He keeps his head down, but has somewhat high knee action. This was an excellent work and I loved the way he was striding out throughout the work. Also working at Santa Anita for the Gotham was INSTAGRAND, who went a half in :47 4/5. In New York, MIND CONTROL breezed a half in :49 4/5 at Belmont or the Gotham Stakes. HAIKAL went his half in :48, and at Aqueduct, NOT THAT BRADY breezed five furlongs in 1:02 4/5. Withers winner TAX, who is waiting for the Wood Memorial, breezed a half in :48 2/5 at Belmont. There has been a lot buzz surrounding El Camino Real Derby winner ANOTHERTWISTAFATE, who won in very impressive fashion. Prepping for his big Kentucky Derby prep on dirt, either the Sunland Derby or Santa Anita Derby, he breezed a half in :49 2/5 at Golden Gate. He is starting to show up on a number of radar screens, based on how he was striding out at the end of the El Camino Real Derby. Some Fair Grounds works of note, LIMONITE and NITROUS went five furlongs in 1:01 1/5 for their respective starts in the Louisiana Derby and Sunland Derby. BANKIT went his five panels in 1:00 4/5, and OWENDALE breezed a half in :49. It’s also a busy week on the international front. First off, there are two Kentucky Derby preps on Wednesday, the Patton Stakes at Dundalk in Ireland and the Derby Conditions Stakes at Kempton in England. The horse to watch at Kempton is JAHBATH, who has won his last three races by a total of 12 3/4 lengths, including a seven-length romp at Southwell in his last start. In Ireland, Aidan O’Brien will try to buy his ticket to Louisville by possibly sending out six horses, including U S S MICHIGAN, a son of War Front, out of an Unbridled’s Song mare who broke his maiden at Dundalk going six furlongs on March 1 and would have to wheel right back. O’Brien also has group 1-placed WESTERN AUSTRALIA, who is bred mostly for grass. At Meydan on Saturday, they run the $300,000 Al Bastakiya, the second leg of the Dubai Triple Crown. Heading the field will be Godolphin’s ESTIHDAAF, a 5 1/2-length winner of the UAE 2,000 Guineas over heavy favorite WALKING THUNDER, who is passing the Al Bastakiya. Estihdaaf will face his Al Bastakiya Trial conqueror MANGUZI, who just hung on for the victory. Also entered is the UAE Oaks winner DIVINE IMAGE, as well as TABARAK, a son of Quality Road, out of an Afleet Alex mare who broke his maiden at Meydan last time out, and the Steve Asmussen-trained TONE BROKE, fourth in the Springboard Mile, but well-beaten in the Al Bastakiya Trial. A victory by Estihdaaf would establish the son of Arch as a heavy favorite for the UAE Derby, which is expected to attract Japan’s DERMA LOUVRE, a son of Pyro who was third in the Hyacinth Stakes to OVAL ACE, a son of Henny Hughes. So both the Japanese colts are Derby possibilities.